B: Dimitri Mellos: What Was He Thinking? Dimitri Mellos: What Was He Thinking? 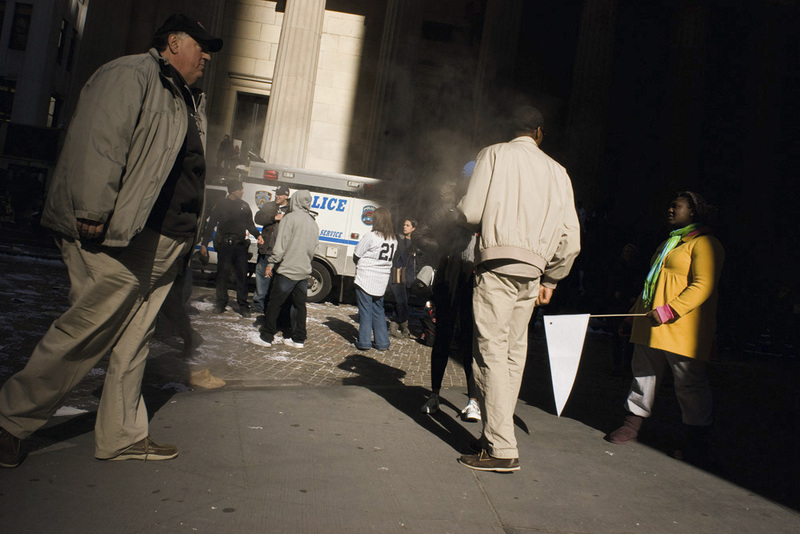 Dimitri Mellos is a photographer based in New York City. "I am interested in pictures that don't provide easy answers and narratives, but rather create ambiguity and a sense of mystery. I am also fascinated by a sense of interiority that people can emit even in the midst of the most crowded and public spaces. 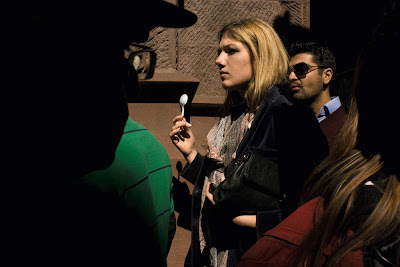 I noticed this woman approaching, and what immediately caught my attention was the glistening plastic spoon she was holding upright, like a tiny flagpole, even though she did not seem to be eating anything. She seemed lost in thought. In the instant it took me to put the viewfinder to my eye, the man in the left entered the frame, and I knew that this would be one of those really serendipitous moments when an unexpected element makes the composition all that much more interesting. I try to invite such unexpected intrusions in the frame when shooting in crowded streets, by always using a wide lens, instead of trying to isolate an ostensible 'main subject' in a photograph. " "This was taken on the pedestrian pathway along the north side of the Ground Zero site in lower Manhattan. It was late afternoon and the light was golden and beautiful, and I shot several frames of commuters on their way home. 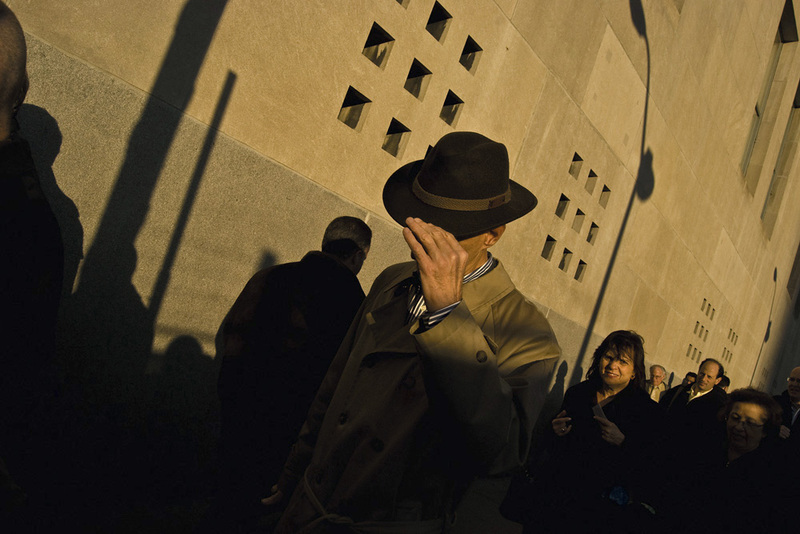 I noticed this man approaching and I was immediately drawn to his slightly old fashioned fedora - however, as he got nearer, he lowered the hat over his eyes, either to avoid me photographing him, or to shield his eyes from the low sun. For a split second I was frustrated that his face was now covered, but luckily in a sudden flash of inspiration I realized that, in fact, his gesture made for a much more interesting picture. This is one of my favorite photographs, but it also makes me sad to think that the beautiful afternoon light would not have been able to reach this wall if the Twin Towers were still standing." 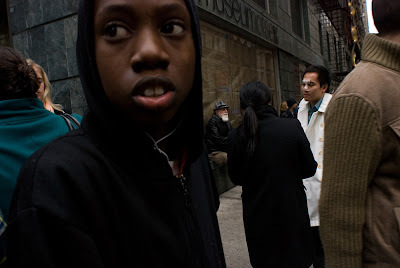 "I noticed this guy with the striking nose bandage, and realized that he probably had had a nose job. What made the image more striking for me was that he was also wearing this bright white raincoat. Luckily, he seemed to be waiting for someone so he lingered around this corner for a few minutes; this gave me the opportunity to shoot four or five frames. In situations like this I am always conflicted between my wish to take a potentially good picture, and my guilt about possibly hurting someone's feelings or making them feel embarrassed, so I try to be as discreet as possible. So I tried to create a composition in which the guy with the bandage would be somewhat in the background, but still clearly noticeable. The man with the white beard and the young black woman in the front provided me with two perfect foils against which to juxtapose the man with the nose bandage. My only regret is that if I had waited another split second, the blonde woman in the left of the frame might have been more visible, which would have balanced the composition out even more successfully." "This picture more than any other epitomizes my feelings and aspirations about street photography. I believe that the conjunction of the photographic gaze with chance and happenstance is essential to the genre, as is an emphasis on the evanescence of the found moment. 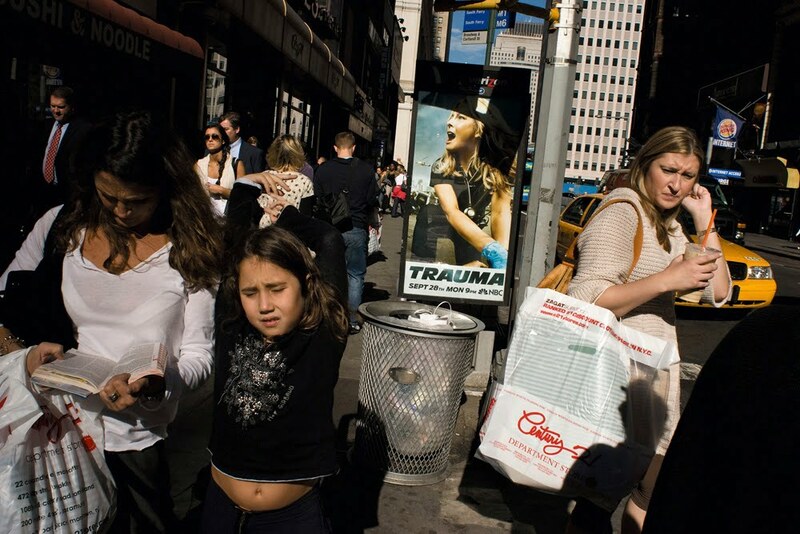 I was struck by how the face of the girl in the foregound was almost uncannily mirrored by that of the woman on the right, and how the poster in the middle provided a kind of foil for both. Luckily I managed to take the picture quickly enough, before their facial expressions changed. No matter how many times I have looked at this photograph, I am always somewhat surprised and delighted that life can create such coincidences. " "I was intrigued by the gaze of this woman - it looked as if she was almost sleepwalking. 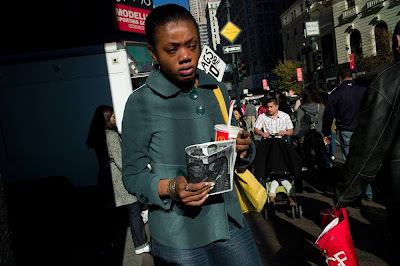 What made the image more interesting to me was the apparent incongruity between her dazed, somewhat vacant gaze, and the fact that she was holding some leaflet she was reading while walking. Also, the detail that there is a repeated portrait of a couple on the leaflet makes this element more formally interesting. Generally, I am struck by the immense proliferation of photographic images in the shared public space of cities, and I try to include such representations and enter into a kind of dialogue with them in my own photographs. " "Because of its architectural structure and layout, New York is fascinating in terms of the interplay of light and shade. There are spots where there is direct sunlight only for a very brief period of time every day. I have noticed such an ephemeral 'lightwell' right outside the New York Stock Exchange, and I occasionally try to go there in the early afternoon to photograph. It is usually hard to make good pictures there, because the place is teeming with tourists (not my favorite photographic subject). But on this one occasion I was lucky. I particularly like this picture because it is literally made out of nothing; all its constituents are in themselves pretty ordinary and insignificant. 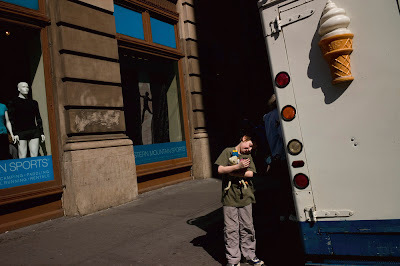 I am generally wary of the kind of street photography that focuses on weird or eccentric people or funny situations for effect - I prefer pictures that are more understated, and show how the ordinary can be transformed into something enchanting when photographed. " 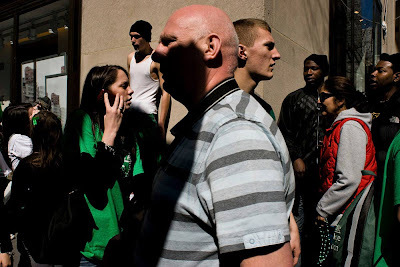 "II always try to go out and photograph when there is a parade - I have no interest in the parades themselves, but what goes on on the sidelines is always ripe with photographic potential. This was taken during last year's St. Patrick's Day parade, along 5th avenue. I like the Janus-like composite of the two male figures in the middle, and the way there is someone who seems to be hovering above the crowd in the background. This was one of those lucky moments when everything in the frame seems to fall into place, and the chaos of the street is momentarily organized into a photograph." "This is one of those pictures where, even though I paid meticulous attention to the composition of the frame, what really resonates with me is not so much the formal qualities of the picture but the content. I noticed this boy waiting for an ice-cream, and was struck by how lost in his own microcosm he seemed to be, tenderly cuddling his muppets. This seemed to me like a really evocative image of childhood. But even more than the boy's expression, my favorite element in the photograph is the man's silhouette in the shop window - my indirect homage to Cartier-Bresson's Behind the Gare Saint-Lazare." A delightful reading! I went through your portfolios and got the impression of a very consistent look. Pattern, light and random conjuctions are in the core of your work, but what struck me the most is your tenacity to go with the flow of life without interrupting it.